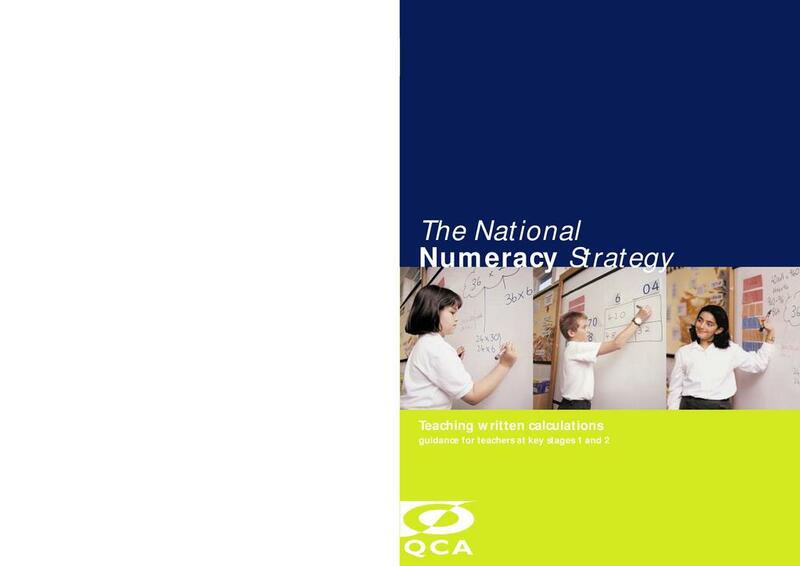 The purpose of this booklet produced by the Qualifications and Curriculum Development Agency (QCDA, formerly QCA) in collaboration with the National Strategies is to outline the development of written methods of calculation and to give guidance to teachers on how best to achieve this. It deals with when and how to introduce written methods and how these link with mental strategies. It builds on the guidance given in 'Teaching mental calculation strategies' also published by QCDA. Part 1 lists the expectations set out in the Framework for teaching mathematics for paper and pencil recording in number. The focus of number work from Reception to the end of Year Three should be on developing mental methods and on the recording of these methods in some written format. Subsequently, students will be taught more formal written methods. The expectation was that by the end of Year Six students would be able to use a standard written method for each of the operations of addition, subtraction, multiplication and division. Part 2 discusses the place of written methods in the mathematics curriculum and attempts to answer some questions about when and how they might be taught. Part 4 has the same structure as Part 3 and relates to the development of written methods in multiplication and division. Part 5 considers written methods that relate to the relationship between fractions, decimals and percentages.